What to do with a bright sunny day? As I have made more and more progress in my photography, I find myself avoiding beautiful sunny days to go out hiking, more and more. Early on, it was the only kind of day that I wanted to go out on. Now, I find myself looking at 10 day forecasts, searching for the cloudy days where the rain chance is minimal. These are the days I fully expect to get some opportunities for good pictures. 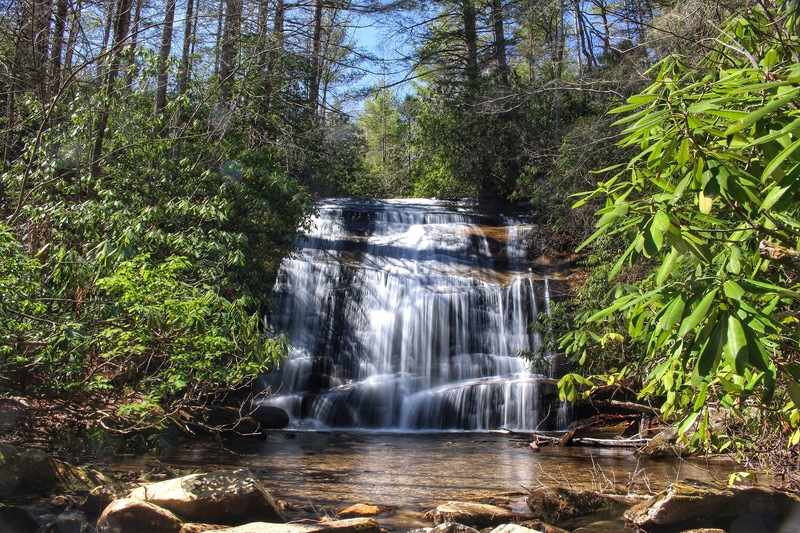 Sunny days…are now left for exploring new waterfalls. I had several locations picked for today’s exploration, as sunshine was the dominant forecast from Georgia to Virginia and beyond. I chose to go to a very familiar area, along NC 281 between Sapphire, NC and the NC/SC state line. 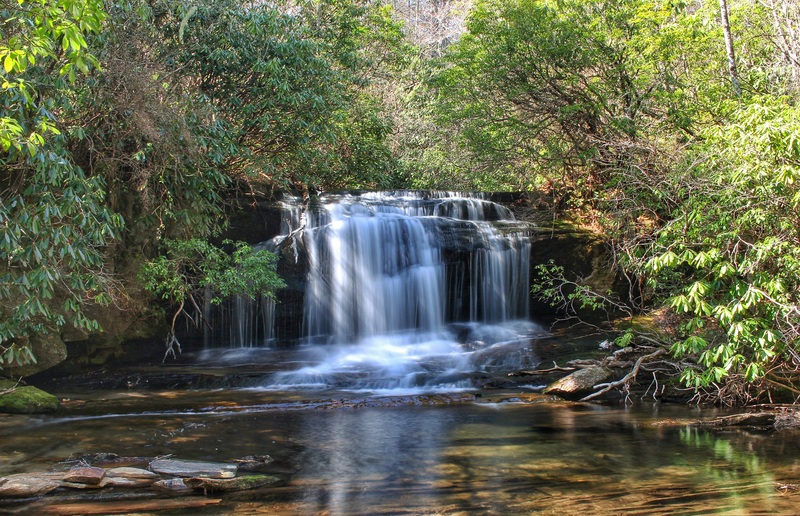 I say familiar, because this is the same area that waterfalls on the Whitewater River, Thompson River, Horsepasture River, and even the Toxaway River are accessed. With all of these nearby rivers, why would anyone want to spend a day on a small creek down here? Because it is here first of all, and the waterfalls while smaller, are beautiful with character, and as I learned today, fairly easy to access. 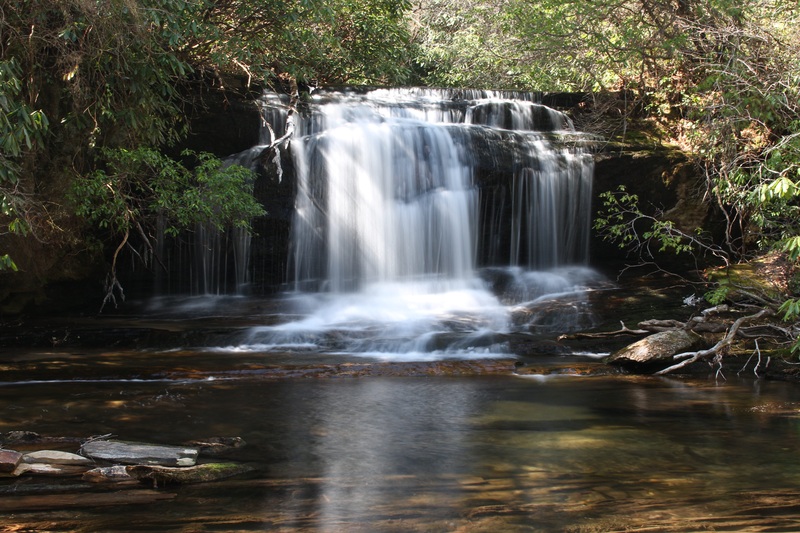 From the intersection of US 64 and NC 281 in Sapphire, take NC 281 south for 5 miles or so, passing Gorges State Park, the Horsepasture River, and The Brewer Rd Area. Heading south, look on the left for a wide open grassy area today park. It will look something like this. This is the view looking north. The highway crosses Mill creek here as it falls and cascades its way down to the Thompson River. 2 waterfalls are very close here, but one would never know it unless they were looking for it. I have passed here numerous times and would have stopped many times by now for photo ops, but…oh well. The first one I went to is Johns Jump. 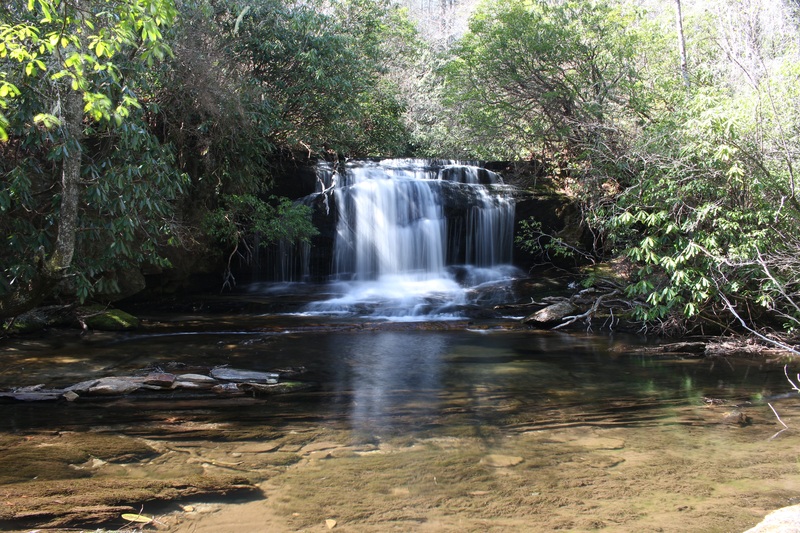 It is a 25 foot nearly vertical cascade that is just downstream from the highway. In the picture above, look towards the telephone pole. The trail head is just before that and heads right. 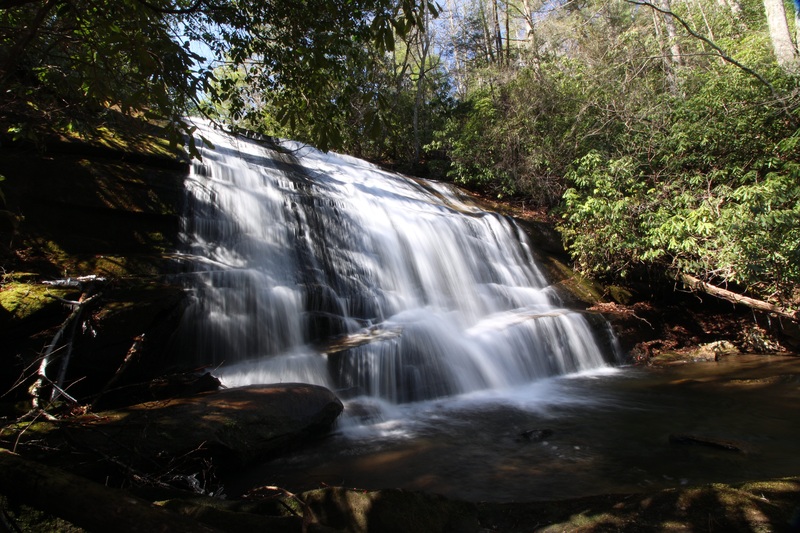 The waterfall can be clearly heard here and this walk is fairly short….but it is also pretty steep. Take your time going down, hold on to roots and trees and shortly come out at the side of Johns Jump. It will take a little maneuvering to get out in the stream to set up for photos. Once there, enjoy the sights and sounds. I had this one all to myself. The return up will get some people huffing and puffing, but I almost always find it easier heading up a steep path than I do coming down one. This one is short though. After the short climb back to NC 281, you can either leave your car there or drive back north across Mill Creek and turn left into a gated forest road. I opted to just walk up the highway a very short ways to the other side of the creek. Once at the road, take it, go around the gate and immediately pass a camping area. Pass this and follow the road as it goes up hill just a bit. 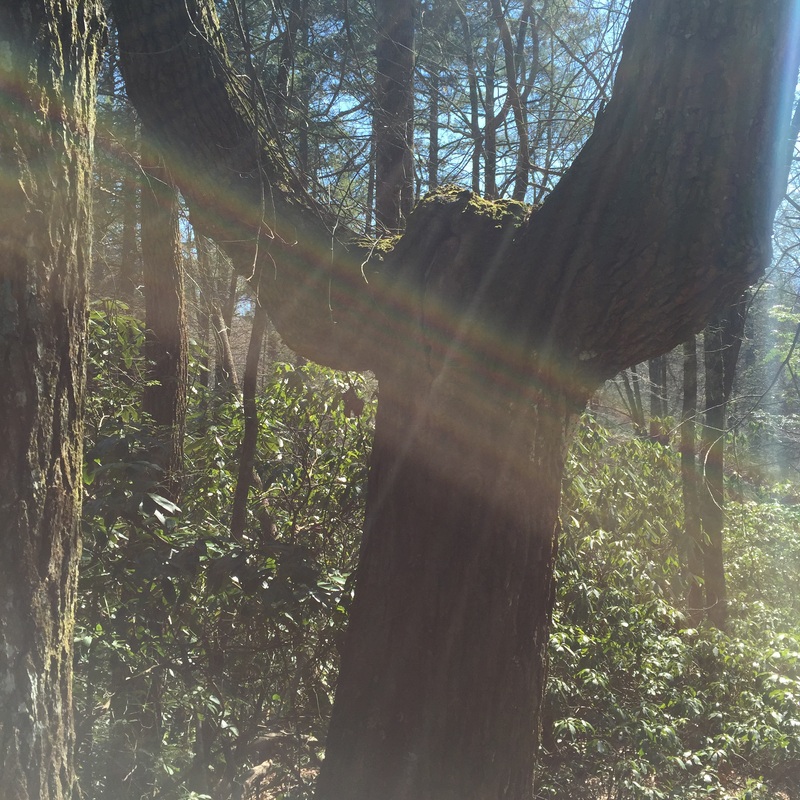 Look for a Y shaped tree..
A smaller trail breaks off left here, take it. It winds around and down to a nice access point to the waterfall from across the pool. This is D.E.W Falls, a small, maybe 15 footer that reminded me of a smaller version of Schoolhouse Falls. The D.E.W. are initials for Dorothy Ehrlich Walker, a young student from South Carolina that passed away in 2003. I am not certain of any of the details. The waterfall while small is beautiful. After the short walk back to the car, this little 2 waterfall stop came in at just under 1 mile round trip for both waterfalls. They were very nice. They certainly are not the biggest that NC 281 has to offer. 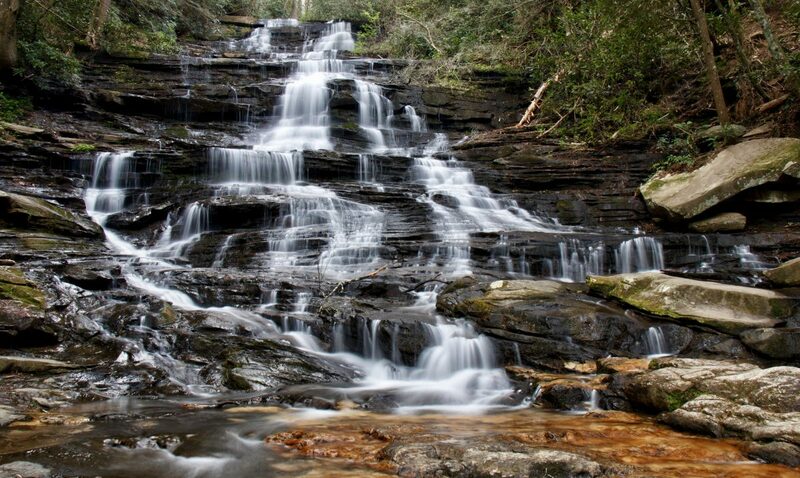 They would be nice stops for those here to see the bigger ones, such as Whitewater Falls, or Rainbow Falls.